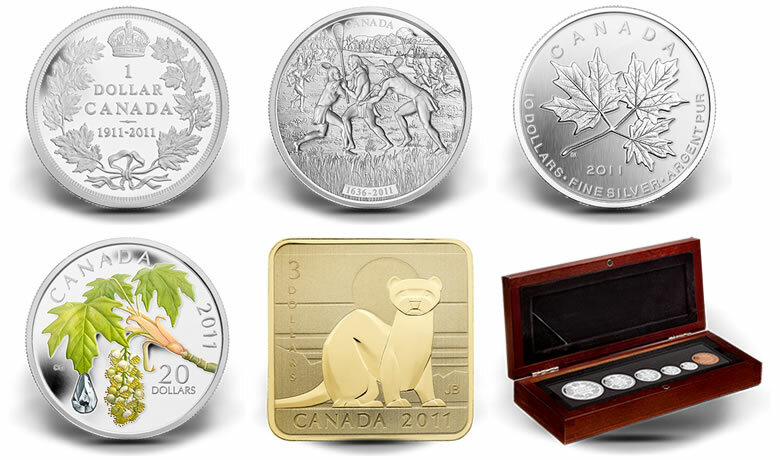 As it finds new and exciting ways to capture Canada’s vast historical, cultural and natural heritage, the Royal Canadian Mint is pleased to launch a new selection of collector coins designed to attract buyers of precious, finely crafted keepsakes and spark the interest of collectors in Canada and abroad. 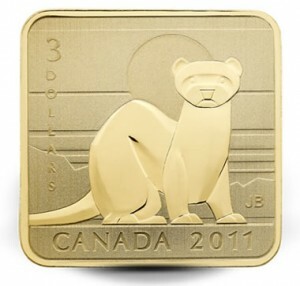 and a square $3 gold-plated silver Wildlife Conservation coin, featuring the Black-Footed Ferret. "As our collector coin business and our customer base keep growing, the Mint is proud to offer new and long-time collectors an increasing choice of coins which captures meaningful themes and attractive designs," said Ian E. Bennett, President and CEO of the Royal Canadian Mint. "This newest product offering shows that the Mint is committed to advancing the artistry and science of coin-making while appealing to the needs of all our customers." Below are descriptions of the featured products which will be available to the public as of July 21, 2011. The Mint is paying tribute to a turning point in numismatic history by issuing a limited-edition silver dollar marking the centennial of Canada’s first and very rare silver dollar. While the Currency Act of 1910 authorized the striking of one-dollar silver pieces for Canada, the passing of King Edward VII in May 1910 and the crowning of King George V pressured the Royal Mint to produce new master tooling for all of Britain’s colonies and Dominions. While a few trial pieces in silver and one in lead had been struck with the effigy of the new King, Canada’s first silver dollar was abandoned in favor of producing existing denominations with the correct effigy of Canada’s new Sovereign. Today, only one 1911 silver dollar remains in private hands, while its remaining lead and silver counterparts have been conserved by the Currency Museum of the Bank of Canada in Ottawa. 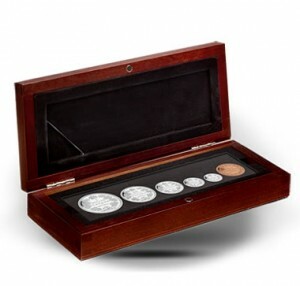 This unique series of circulation coins is faithfully reproduced in a special-edition, double-dated proof set of all of Canada’s existing denominations of the era, including the short-lived one dollar coin. With exception of the pure copper penny, all these historic coins are crafted of sterling silver. 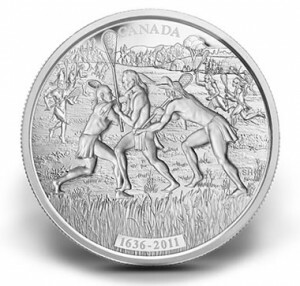 The rising popularity of its silver kilo coin category has allowed the Mint to use this bold format to strike a 99.99% pure silver kilo coin with an intricate new design imagining the scene, 375 years ago in New France, of the first European observation of the timeless sport of Lacrosse by French Jesuit priest Jean Brébeuf in 1636. To First Nations people, including the Huron Nation among which Jean Brébeuf lived, as the sport originally named "baggataway" was revered as "The Creator’s Game", thought to have been invented for his own amusement. It became a proving ground for young warriors and a non-warring way to settle tribal disputes, with matches covering vast expanses and sometimes lasting months at a time. The maple leaf is the symbol which says "Canada" to the rest of the world. Its image has been celebrated in art, literature and even song, when Alexander Muir’s "The Maple Leaf Forever" was published in 1867; the year of Confederation. In June 2011, the Mint produced gold and silver kilo coins whose maple leaf design was inspired by the reverse of our iconic one-cent "penny" circulation coin. 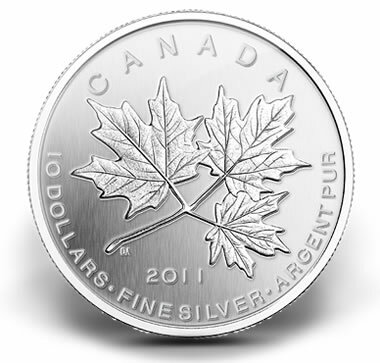 Designed by artist Debbie Adams, the trio of maple leaves honoring "The Maple Leaf Forever" can now be found on a half-ounce, 99.99% pure silver coin with a $10 face value. One of the Mint’s most popular technologically-enhanced coins returns with the new "Bigleaf Maple" crystal raindrop coin. 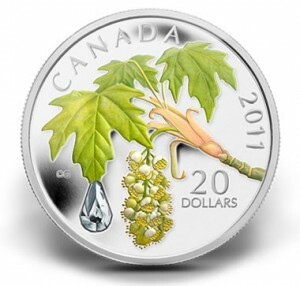 Made of 99.99% pure silver and designed by renowned botanical artist Celia Godkin, this coin features a painted leaf of this gigantic West Coast maple species from whose tip clings a drop of water representing by a brilliant Swarovski Element crystal. The fourth installment of the Mint’s unique square-shaped, gold-plated silver collector coins honoring some of Canada’s most vulnerable wildlife species features the Black-Footed Ferret. Displaced from its native Canadian Prairie habitat in the early 20th Century, the Black-Footed Ferret is gradually returning to the Prairie through the efforts of dedicated volunteers and conservationists who are re-establishing colonies through efforts such as the Grasslands National Park wild release program. All of the Mint’s products are available directly from the Mint at 1-800-267-1871 in Canada, 1-800-268-6468 in the US, or on the Internet at www.mint.ca. The coins are also available at the Royal Canadian Mint’s boutiques in Ottawa, Winnipeg and Vancouver, as well as through Toronto’s CN Tower gift shop, and via our global network of dealers and distributors, including participating Canada Post outlets. will there be a coin for the famous day of November 11, 2011 (11/11/11)?